Huge thank you to all who participated in our 39th Annual Holiday Festival in downtown Bellingham, we appreciate your support! Huge thank you to our sponsors below! The 2019 Holiday Festival will be our 40 year Anniversary! Stay tuned on location and participating artists. Want to be involved in the 2019 Holiday Festival – See below for our updated Artist Application. The Holiday Festival of the Arts is a five-week-long indoor arts festival featuring 100 artisans from our region. Aside from vendors selling their wares, the festival boasts live music and art workshops for children on the weekends. The twofold purpose of the Holiday Festival is to encourage and support the creation and sale of locally produced fine art and crafts while providing an opportunity to connect artists and craftspeople with the general public. This juried festival pursues top quality original arts and crafts and seeks excellence in presentation. Festival proceeds support the visual arts in the region through Allied Arts of Whatcom County’s general and educational programs, community outreach, arts events, gallery shows, and artist demonstrations. Doug LeClair’s work features images of magnificent mountains, rivers, and forests in the Skagit Valley, the San Juan Islands, the Palouse and other regions of Washington State. Laura Bergsma makes bright, whimsical and humorous animal art (mostly canine) which she featurs in matted fine art prints, note-cards, magnets and children’s books. Lois Dahl’s hand crafted greeting cards and prints add a touch of whimsy to every day. John D’Onofrio captures the beauty of our world through his breath-taking photography. Terry MacDonald bold use of color in his mixed media creations will bring a smile to your face. Louise Magno presents stunning images of wildlife and landscape nature photography. Barbara Marks shares beautiful scenes of Pacific Northwest wildlife on cards and prints of varying sizes as well as on magnets, cups, trivets, and cutting boards. Shawna Morris’s work is fearless and brave; sometimes whimsical, always deep. Shanni Welsh believes that art, like life, should be full of smiles, laughter and love. Virginia Baker creates classic, elegant watercolor illustrations. Michelle Bullock uses a variety of mediums to paint and draw patterns, animals, and landscapes with bold lines and vibrant colors. Mary Gregg Byrne’s lovely watercolor and oil paintings are created with traditional methods, some of which incorporate gold leaf embellishments. Bev Connor uses pen and pencil drawings to capture the personalities of wild birds and mammals in her portraits. Peggy Cook creates bright colorful, feel good paintings with a touch of humor. Georgia Donovan paints bright whimsical acrylics with clever themes that will make you smile. Donald Dye’s wildlife images on copper are a festival favorite. Ria Harboe gravitates to painting another level of awareness, one that is just beyond the real world. Laurie Potter works magic with paint creating amazing bird portraits that touch on surrealism. Ciara Sana’s style is influenced by her love for traditional tattoo art, art nouveau, and various whimsical styles. Cheri Shields’ Sun Goddess Series is an interpretation of a classic feminist symbol of strength and warmth. Each is an original acrylic painting on board or panel. Chris Shreve’s paintings and illustrations are filled with creatures of whimsy that will bring a smile to your face. Alan Stanchi’s impressionistic and abstract works reflect the beauty of nature. James Williamson is a watercolor artist whose subjects include marine vessels, lighthouses, and marine landscapes of the Pacific Northwest. Safe for the entire family – from your little ones to the family dog. Lost Art Apothecary’s products can help everyone feel great. Realms Bath & Body Line has all you need to transform your bath into a spa experience. Birchwood Botanical’s gift baskets make the perfect gift. Complete with natural bath salts, soaps, and body butter. Sea Holly Beauty Company creates one-of-a-kind products that soothe, moisturize, and rejuvenate your skin. Sea Witch Botanicals offers all natural handcrafted salves, lotions, facial soaps, beard tonics, and home and body products for your health and beauty. MW Soapworks creates all-natural soap and skincare products that include moisturizing oils and butters, sustainable palm oil, and organic botanicals when possible. Their products include many options for men. She also crochets scarves and hats in colorful, yet simple designs. Karma Maclachlan makes beautiful organic skin-care products, luxury soaps, and candles. Steve Dalton’s wheel thrown stoneware pottery are beautiful and functional, and inspired by colonial pottery design. Ruthie Gibbs makes ordinary serving dishes extraordinary. Jeff McDougall creates high-fire stoneware and porcelain pottery for kitchen and bath. Lois Tuppeny has such a creative spirit and skill. Her pottery is truly one-of-a-kind. Deborah McCunn’s uses her clay works to challenging assumptions. Each character she creates has a unique personality and story. Nana Thebus’ stoneware collection uses subtle color and earthy texture to portray botanical themes and whimsical entities of nature. Handmade polymer clay ornaments and jewelry. Mary Barstow uses quilting and machine embroidery techniques to make her wall hangings, table décor, ornaments, bags, aprons, and towels. Nancy Golladay’s adorable stuffed teddy bears are truly one-of-a-kind. Lori Hills capricious ostriches animate mugs, tote bags, tiles and pillows. Sue McCaslin’s handcrafted knitwear for infants and children is both unique and practical. Her sweaters, vests, and hats range in size from newborn to 4-5 years of age. Sue’s items are often made from washable Merino wool that she hand-dyes in colors reflecting local island flora. Texture Clothing makes fashion that’s flattering from head to toe, using high-quality materials like hemp and 100% organic cotton. Judy Sauer uses quilting and applique techniques to create her wall hangings, runners, place mats and fabric greeting cards. Sandy Scatz makes charming one-of-a-kind hats. Mesee Wilson uses reed, split wood, wool and other mediums in her basketry designs. Sid Winter’s fun and functional fabric goods such as aprons, totes, and coffee cozies make great gifts for anyone on your list. Artisan handbags, purses, totes and pouches made with an eclectic variety of carefully-curated fabrics, with a focus on melding style with function. High quality, handmade fairy tale dress up clothing for children of all ages. Another Wave Fiber Art is the place to go for all of your tie-dye needs. Handmade ceramic tiles for art or installation. 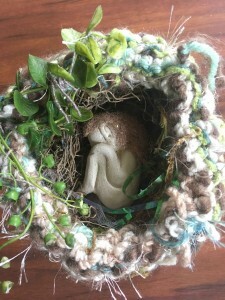 Margaret Nathon uses repurposed wools to make dolls, puppets, garlands, toy felt foods, draft catchers and tea cozies. Holmquist Hazelnuts offers raw and dry roasted hazelnuts with flavors like sea salted, ranch, southwestern, orange honey, butter toffee, honey roasted cinnamon and Belgian chocolate. Great for stocking stuffers or hostess gifts. Shrub is a colonial-era drink whose name is derived from the Arabic word sharab, to drink. It is concentrated syrup made from fruit, vinegar, and sugar that is traditionally mixed with water to create a refreshing drink that is simultaneously tart and sweet. Trilby’s BBQ Booth has all anyone ever needs when it comes to scices and other BBQ needs. Le Gourmet Girl offers herb infused oils, organic flours, salts & sugars. Delicious! MarJoe makes amazing gourmet fudge. She produces around 20-30 different wrapped flavors for this event. Get some before it’s gone! Jennifer Korn-Leech’s uses bright colors and carved patterns in her kiln fired bowls, hangings, ornaments and vases. Ebba Krarup creates beautiful and functional fused glass work. Sand blasted glassware in original northwest designs. Hand dotted glass window hangings and ornaments. Unique hand made jewelry. Karla Eames glasswork make great stocking stuffers. Celebrate the season. Glassworks Northwest is a pop of color on a dark day with beyond colorful glass plates, bowls and decorations. Sarah Brockman’s signature artisan jewelry designs include woven wrap bracelets, hand-dyed & hand-sewn silk ribbon wraps, etched Mother of Pearl, Blacklip and Abalone shell pendants, and mixed metal focal pieces. MeG Jewels makes Jewelry designs from elegant to casual and everything in between. Handcrafted jewelry and metal art objects, made with love. Karen Kramer’s beautiful jewelry captures a wide range of colors and shapes. Victoria Roberts silver and glass Jewelry is understated beauty at its finest. She-Ra Creations are a spectacle to behold. Gorgeous beading and gems combinations make masterpiece jewelry. Bonnie Rose is jewelry obsessed! Vintage, new, unique, handmade… she loves it all. Elegance with a Flair will be joining us with some lovely beaded jewelry and art cards. Nicole Annette Jewelry brilliantly combines silver with colored beads to make fun accessories. Marlene Van Beek’s elegant jewelry designs feature rich colors and metallic accents. Robert Keene creates handcrafted sterling silver, copper, and bronze jewelry. Custom designs available by request. Jan Landin’s unique studio-designed jewelry is created with sterling silver, copper, and various semi-precious stones. Gloria Shannon’s jewelry is beautiful and very clearly wearable art. Sure to be a conversation starter. Handcrafted tiny terrarium jewelry made from locally foraged moss, lichens and ferns in the Pacific Northwest. 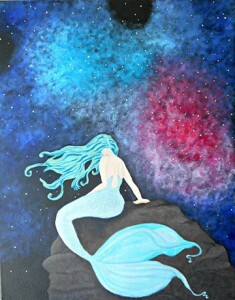 Patricia Shea uses water color, ink and acrylic paints in her work. The sculpted mixed media creations of Clarissa Callesen are not to be missed. Her eerie steampunk dolls and sculptures are intense and edgy. They are a fascinating sight to behold and would love to travel home with you. Deborah Dole’s acrylic paintings and prints are colorful, layered, and intuitive. She also creates mixed metal ornaments and jewelry, which are etched and hand-cut, as well as her hand-sewn bags from painted fabric. Susan Rothschild’s mixed media work consists of images printed on paper, glass, tile, canvas, and porcelain. Rachel Simpson uses recycled materials, paints, found objects, books, paper, and textiles to create whimsical art. Some is functional, such as her book boxes, while others like her tea cup art are meant to be enjoyed visually. Edgar Smith’s pieces are designed to be fully functional, yet unique and attractive. They incorporate salvaged materials that would otherwise be melted down, crushed, or permanently distorted forever. Their past and future lives do not know one another but are intimately connected as they are transformed. Validate Appreciate makes colorful, child-centered furniture, stuffed animals and gifts. Graham Schodda’s metal sculptures are fun and entertaining pieces inspired by nature. Pandora Daugherty sculpts small and large scale fantasy and sea creatures. Dawn’s Designs offers a variety of soft handcrafted winter ornaments such as snowmen and felt Santas. Glitt3r Lyfe offers magical things to help enhance the joys of day to day life. This includes lovely and peculiar jewelry, glittery cosmetics, and hilarious shrimp art. Todd Warger is a northwest historian and filmmaker. His film credits include the documentaries Shipyard and The Mountain Runners. He is the recipient of the 2008 Washington State Historical Society’s David Douglas Award. Ginny Snowe uses antique and vintage wooden molds collected from around the world to make beeswax ornaments for home and holiday. All ornaments are made using local beeswax. Katherine Potzler’s multipurpose and fashionable handmade journals make perfect gifts. Beth Anna Margolis is an Artist, Writer and Lover of nature. Northwest Authors 4 Authors is a group of seven local, independently published authors whose purpose is to help each other market our individual works and to provide opportunities, most notably the Bellingham Holiday Book Festival, for other local authors to market their writing. Artist application deadline: Applications for the 2019 Holiday Festival will be due No Later than Thursday, April 25th, 2019. Volunteering: We can’t pull off amazing events like these without great volunteers like you! There will be a $2 Fee applied to any card purchase at the Holiday Festival. Check out our discounted lodging options available to you here!